Members of the House shared some lighter moments. HPCC chief Kaul Singh in his call attention notice on fire incident in Solang village said that the Congress workers had distributed ‘tandoors’ among the affected residents. Pradesh Congress Committee chief Kaul Singh has allotted duties to party secretaries, who have been attached with various general secretaries and vice-presidents for the purpose. Electricity charges in the hill state are likely to go up sharply with the state electricity board proposing a steep hike in the tariff structure in the aggregate revenue requirement (ARR) for 2009-10 filed with the electricity regulatory commission. The fate of over two dozen teachers who have been working in the District Institute of Education and Training (DIET) in the state for the past more than eight years in service hangs in balance as the education department is not considering them for regularisation. The district has achieved 52 per cent target in loan distribution against total credit plan of Rs 210.6 crore. Loans worth Rs 108.56 crore have been disbursed by various banks during the current financial year so far. The gelatin sticks seized from some Nepali labourers at the Chandigarh bus stand were not stolen from the 111-MW Sawra Kuddu hydroelectric project in Rohru as was being suspected. 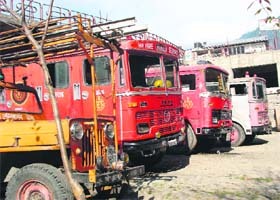 The fire station of popular tourist town, Manali, is in a state of neglect due to lack of proper equipments, infrastructure and shortage of staff. The Manali fire station, which was established in 1979, has not kept pace with increase in tourism industry, population, hotels and other structures in the upper Kullu valley. The state unemployed ayurvedic doctors association while reacting sharply on a notification issued by the state ayurved department for making batch-wise appointments of doctors without relaxing the upper-age limit, alleged that the state government had adopted double standards in making appointments of ayurvedic doctors and the TGT teachers. 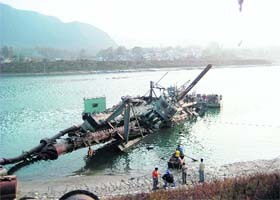 How much care the Bhakra-Beas Management Board takes of its costly machinery became public when a dredger worth Rs 9 crore purchased in 2004 was found sunk in the balancing reservoir on Tuesday morning. The Vidhan Sabha discussed the Swan canalisation project in detail on the first day of winter session here today. BJP MLA from Una Satpal Satti moved a resolution under rule 63 to have a discussion on the issue that was allowed by the Speaker. Irked over the move of the state government to attach the district hospital with a proposed private medical college at Hamirpur, the CPM, CPI, BSP, SFI, CITU, Janwadi Mahila Samiti and a few other voluntary organisations have decided to hold a joint convention on December 13 at district headquarters to oppose the move. 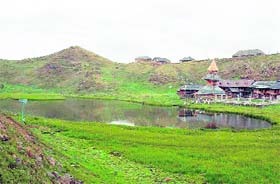 The state unit of the CPM has opposed the move of the government to relax the State Land Reforms and Tenancy Act to ease restriction on the purchase of land by industrial houses from outside and termed it as yet another example of anti-Himachali policies being pursued by the Dhumal government. The Kullu block Congress committee has unanimously resolved that the party should consider the name of former Chief Minister Virbhadra Singh for giving ticket from the Mandi Lok Sabha seat. The Himachal Vidhan Sabha today withdrew the Himachal Pradesh Judicial Amendment Bill 2006 that was earlier passed by the House on April 7, 2007. The assembly had passed a bill granting financial powers to decide perks of judicial staff to the state judiciary. Paonta residents today witnessed tight security arrangements in the wake of a possible terror attack in Paonta town on December 11. The town remained peaceful except one false alarm of a bomb in Nihalgarh village which created some panic. The Himachal Vidhan Sabha adopted a unanimous resolution condemning terror attacks on Mumbai on the opening day of winter session here today. Besides the CM, leader of opposition Vidya Stokes, HPCC president Thakur Kaul Singh, former Chief Minister Virbhadra Singh, health minister Rajiv Bindal and BJP state president Jai Ram Thakur also condemned the terror attacks. The CM also moved a resolution expressing grief over the demise of former Prime Minister V.P. Singh and former MLAs Dharampal Thakur, Sita Ram Sharma and Devi Ram Kewla. Question hour could not be held as the time for it lapsed while the members expressed grief at the demise for former MLAs and condemned the Mumbai attacks. The legislations passed in the last session and ratified by the Governor were also tabled in the House. Education minister Ishwar Dass Dhiman introduced a Bill that would replace the ordinance issued by the Governor earlier to permit two private universities, including Chitkara and Eternal universities, to function in the state. The Governor had issued an ordinance on November 7 allowing the said universities to function in the state. The report of the public accounts committee was also tabled in the House. HPCC president Kaul Singh moved a call attention notice to highlight grievances of Solang village, near Manali, where 42 houses were destroyed in a fire on November 25. He demanded that the government should provide free wood through the forest corporation to help the affected villagers build their houses. He also drew attention of the House towards the need to improve fire-fighting facilities in the state. The CM said the government would look into suggestions given by Kaul Singh. He, however, added that the financial and other help was already being provided to the affected villagers. Kuldeep Singh Pathania, MLA from Chamba, demanded that the water supply scheme in Rangar village should be made operational at the earliest. Des Raj, MLA from Ganganth, demanded that the fee imposed in vegetable market of Damtal should be withdrawn. The CM said the fee had been imposed as per the existing rules and regulations. Rajesh Dhirmani, MLA from Ghuwarmi, drew attention towards the need to complete the Ladhwai-Lajta-Matiyal and Gharwar-Kuthera roads and Seer rivulet bridges at the earliest. Members of the House shared some lighter moments. HPCC chief Kaul Singh in his call attention notice on fire incident in Solang village said that the Congress workers had distributed ‘tandoors’ among the affected residents. Satpal Satti moved a resolution for discussion on Swan canalization project in Una district. While speaking on the issue both the BJP MLAs from Una district Satpal Satti and Varinder Kanwar went overboard to praise the CM for getting the project sanctioned. They said that the project was likely to change the economy of Una district as well as the state. The CM speaking on the issue, however, protected his MLAs by saying that the issue of Swan canalization was close to his heart. Kailash Prasher and Yog Raj will assist vice-president Gangu Ram Musafir, who looks after five assembly segments of Hamirpur and the SC Department. Similarly, Adarsh Sood and Suresh Kumar have been attached to Ram Lal Thakur for four assembly segments of Kangra, one of Chamba and the Legal and Human Rights Department. Navneet Sharma and Virender Sood will assist Sujan Singh Pathania, who is in charge of the Youth Congress and four assembly segments of Shimla district. Susheela Negi has been attached to A.N. Vidyarthi (ST Department and four constituencies of Shimla), Sanjay Awasthi to Anil Sharma (NSUI and four segments of Kangra), Urmila Sharma to Kunjna Singh (Minorities Department and three segments of Shimla), Vinod Sultanpuri and Ashwarya Katoch to Harbhajan Singh (Mahila Congress and five segments of Mandi) and Manju Sharma to Anita Verma (Ex-Servicemen Department and five segments of Una). Rohit Thakur and Hoshiar Singh have been attached to general secretary Asha Kumari (party organisation and four segments of Kangra), Sohan Lal to Sukhwinder Singh (Sewa Dal, planning and training and four segments of Kullu), M.P.S. Rana and Surinder Sethi to Mukesh Agnihotri (Media Department and three segments of Dehra subdivison), Manbhari Devi and Arun Sen to Ajay Mahajan (Traders Department and four segments of Chamba), Ajya Solanki and Indu Patiyal to Sudhir Sharma (Teachers Department and four segments of Bilaspur), Ravi Thakur and D.K. Lath to Kudeep Rathore (Protocol, Panchayati Raj Department and five segments of Solan), Sanjay Rana to Satya Prakash Thakur (Kisan Mazdoor Congress and five segments of Sirmaur) and Harminder Thakur to B.D. Chaudhary (OBC Department and Rampur, Kinnaur and Lahaul-Sipti segments). As against the expenditure of Rs 2021 crore approved by the commission for the current financial year, the board has projected a revenue requirement of Rs 2853 crore for 2009-10, a hike of over 40 per cent. If approved, the average tariff will shoot up from Rs 3.68 per unit to Rs 4.60 per unit, the brunt of which will have to be borne by the domestic consumers as the power subsidy has been frozen at the level of Rs 140 crore under the agreement signed by the government with the World Bank for availing Rs 900 crore development policy loan. The highest increase has been projected in the employees cost which is to go up from Rs 510 crore to Rs 839 crore on account of the likely implementation of pay commission report during the year. In the multi-year tariff the commission had approved an employee cost of Rs 539 crore for 2009-10. Consequently, the employee cost, which is already highest in the coutnry at Rs 95 paise per unit, will jump to Rs 1.50 paise per unit as per the projections. The other major factor contributing to the increase in expenditure is the high cost of power purchase due to declining surplus. The commission had approved Rs 1310 crore for power purchase for the current year against which the board will have to spend Rs 1519 crore as per revised projections. The projected requirement for power purchase for 2009-10 is as high as Rs 1640 crore, mainly because the state has been left with little surplus power due to sharp increase in demand for industrial power over the past three years. It has been left with no option but to purchase more power from other state at very high rates to meet the shortfall during the lean winter months. The total availability of power has been projected at 6900 million units, out of which 6200 million units will be sold within the state. The quantum of surplus power available for sale outside the state will decline from 1330 million units in the current year to 684 million units in 2009-10. The committee expenditure on account of payment of interest on loans will go up from Rs 174 crore to Rs 209 crore. The commission will announce the tariff after conducting public hearing by March next. The board and the consumers will have to pay for the wrong policies of the government to encourage poor intensive units as a result of which the state is forced to purchase power from outside the state at exorbitant rates and supply it to industrial units at rates much lower than average selling rate. Narrating their tale of woes, DIET teachers rued that they had been running from pillar to post, making rounds of the office of the director of education, but the directorate has rejected their pleas with reasons best known to them. “The officials sometimes ask us to approach the elementary and some times the director, higher education”, they complained. As a matter of fact, Chief Minister Prem Kumar Dhumal has announced that the government would regularise the services of school lecturers who have put in more than eight in service, they pointed out. The DIET teachers said they came from the same parent cadre as those of school lecturers and had put in more than eight years in service in the DIETs in each district. But it is highly discriminatory that they are not being considered for the regularisation, they added. They complained that they had brought the matter to the notice of the elementary and higher education departments, but they were not listening to them. We have no alternative except approaching the media as a last resort, teachers said. Director, education, OP Sharma when quizzed on this issue, said, “They have not brought the matter to his notice. But DIETs come under the control of the elementary education department. Still we will consider their case sympathetically, once the matter is taken up with the department”. Sharma said the process for regularisation of school lecturers had started and they fell in different categories. The department will regularise only those teachers who fulfil R and P rules and have completed minimum eight years in service, he added. This was stated by additional district magistrate Subash Chaudhary while presiding over a meeting of the review committee of district credit plan here today. Chaudhary said the district had achieved the target of 45 per cent in the priority sector and 105 per cent in the non-priority sector in distribution of credit. It was 48 per cent in case of the agriculture sector, 32 per cent in case of small-scale sector and 42 per cent in case of the service sector. Chaudhary urged all banks and district officers to work hard to ensure achievement of targets in all sectors so that people of the district can take maximum advantage of government schemes and get benefits of these at the earliest. The ADM also released the “potential linked credit plan” for the year 2009-10 in which stress would be on agriculture, animal husbandry and horticulture. Assistant general manager of the Reserve Bank of India (Shimla) Kalidass said the business target for the banks of the district was Rs 1,434 crore up to March 31, 2008, which had been revised to Rs 1,525 crore now. R.N. Nagi, sub divisional manager, NABARD, said the district was importing milk worth Rs 22.26 crore every year from outside the state while only 37 kisan clubs had been set up in the district till now. He exhorted banks to set up more kisan clubs under their jurisdiction and thus help farmers get economic benefits out of the scheme. District manager of the UCO lead bank K.C. Sharma also addressed the meeting. The Shimla police today checked stores of the project and found that the markings on the sticks did not match with those found on the seized explosives. The police also checked various stores of the Public Works Department (PWD) in the area and found that these were entirely different from the stock. The name of the manufacturer and other markings on the seized gelatin sticks did not match with those on the material stocked in the stores. Superintendent of police R.M. Sharma said all explosive stores in Rohru subdivision had been checked. The labourers might have procured the explosive material from the adjoining area of Uttarakhand where a lot of construction activity was going on. He said all stores were being checked in the district. Regarding the recovery of equipment used for printing fake currency like scanner and computer from a house in Kotkhai by the Bathinda police, he said no fake currency was recovered. House owner Mast Ram said three persons from Punjab had hired the house about a month ago. They stayed in that house for only four days, he added. The fire station of popular tourist town, Manali, is in a state of neglect due to lack of proper equipments, infrastructure and shortage of staff. The Manali fire station, which was established in 1979, has not kept pace with increase in tourism industry, population, hotels and other structures in the upper Kullu valley. It has no proper building and all fire engines have to be parked in open. Moreover, all engines are in a state of disrepair. During winter, these vehicles are generally subjected to a heavy snowfall and have to be cleared regularly to keep them ready for an emergency. The fire station serves a vast area from Naggar (on left bank), Patlikulh on the Manali-Kullu road and Kothi village on the Manali-Leh highway. According to sources, the fire station possesses three water tenders and one jeep fire engine made in 1986. Except for one water tender, which was procured in 2001, others two are more than 24-year-old. They also have two portable pumps, which are heavy and difficult to carry. Though the fire station has already been reportedly sanctioned one post of the station fire officer, the post has not been filled so far. There is one sub fire officer, two leading fire men, and four fire men regular besides six fire men part time from the Himachal home guards. To top it all, the staff work in four shifts. Residents said the modernisation of the fire station would not only be beneficial to the residents of the upper Kullu region, but also help fight fires more effectively. Residents of Patlikulh and the adjacent villages said it would be more convenient if a fire station was set up there or at least a jeep fire engine be deployed there. Talking to mediapersons here today, president of the state association Sanjiv Guleria and senior vice-president Vipon Mahajan rued that in TGT recruitments even candidates who were 57-year-old were appointed, but in the case of ayurvedic doctors, the government had fixed the upper-age limit to 45 years. “The government is appointing even retired allopathic doctors and meting out step-motherly treatment to jobless ayurvedic doctors,” they lamented. They further said unemployed doctors who had crossed their upper-age limit were being penalised without any fault and deprived of justice. The association has sought help of Chief Minister Prem Kumar Dhumal in this regard. The BBMB had purchased three dredgers to dredge out silt from the balancing reservoir so that silt-free water could be provided to 990-MW Dehar powerhouse. These dredgers are used during the monsoon only. For the remaining part of the year, these remain stationed by the side of the reservoir. On Monday night, some workers noticed that the dredger was sinking. They informed the higher officials about it. However, by the time the officials reached the spot, the dredger had completely sunk in water. Next morning, two cranes, a steamer and a number of BBMB workers were deployed to extricate the dredger. The water level in the reservoir was also reduced. People alleged that the incident had brought to light the carelessness of the BBMB staff. They were not bothered about the costly machinery when it was not in use, they alleged. According to BBMB chief engineer Anil Gupta, he rushed to the spot as soon as he got information about the dredger. Due to some leakage, water had entered into a portion of the dredger leading to its tilting on one side, he said. 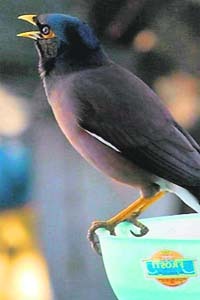 The BBMB had contacted experts from Mazgon Dock, Bombay, in that connection and a team of experts would reach here shortly. The priority would be to bring the dredger in its original position. The reasons behind the incident would be ascertained later. He had not ordered any inquiry into the matter so far, he added. As the water level in the reservoir had been reduced to save the dredger, only one out of the six turbines of the 165-MW project was operational. This would hit power generation at the project. The situation would continue for some more days, sources said. Satti and Varinder Kanwar said Swan canalisation was vital for the development of Una district. The first phase of canalisation from Jhalera to Una has saved 800 hectare fertile land that was earlier uncultivable due consistent floods in the river. They said the second phase of canalisation from Gagret to Una should also be completed at the earliest. Both MLAs praised the Chief Minister for taking personal initiative and getting the project passed. Former Chief Minister Virbhadra Singh termed the Swan river as sorrow of Himachal. He said although Prem Kumar Dhumal had inaugurated the project during his earlier stint in power, the Congress had also arranged funds and continued the project during its last stint. Dhumal said he was making all efforts to get the Swan canalisation project completed and the issue of “one rank, one pension” for ex-servicemen settled at the earliest. He also accepted wishes of Virbhadra Singh for success on both issues. They alleged the decision had been taken by the government to help the industrialists by handing over the health services to them. They further said people of the district would not allow this and oppose the move. These parties and organisations would start mass-awareness campaign at the village level and organise similar conventions at the block level, too, to oppose the privatisation of health services, they added. The joint forum has decided to stage a one-day dharna at the district headquarters in front of the district hospital. They have also threatened to gherao the Vidhan Sabha during its budget session, if the state government did not withdraw the July 15 notification to attach the district hospital with the private medical college. The state unit of the CPM has opposed the move of the government to relax the State Land Reforms and Tenancy Act to ease restriction on the purchase of land by industrial houses from outside and termed it as yet another example of anti-Himachali policies being pursued by the Dhumal government. It has warned of a statewide campaign on the issue to expose the BJP if the government went ahead with the proposal. Secretary of the party Rakesh Singha said the move was deplorable in view of the fact that the people who have been living in the state for generations were not allowed to acquire even a small piece of land for building a house. The amendment to relax Section 118 of the Act under which non-agriculturists were debarred from acquiring land in the state without prior permission of the government would open floodgates for big industrial houses. Moreover, poor farmers, who already have very small landholdings, would be forced to sell their land to industrial houses and would eventually become landless. He said if Section 118 of the Act was to be amended at all, it should be only for allowing the bona fide residents of the state to purchase land for construction of house and not for opening floodgates for outsiders. President of the committee Uttam Sharma said a general meeting of the workers was held at Puid village in the Khrahal Valley yesterday and the party high command urged to field Virbhadra Singh from the Mandi parliamentary constituency. Karan Singh, a former minister in BJP government who had recently joined the Congress, said the BJP was a party of leaders who backed out from their commitments. Former minister Satya Prakash Thakur congratulated Sonia Gandhi on party’s recent victory in Delhi, Rajasthan and Mizoram. 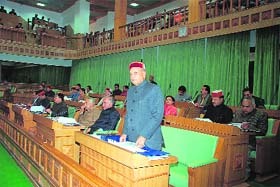 The Himachal Vidhan Sabha today withdrew the Himachal Pradesh Judicial Amendment Bill 2006 that was earlier passed by the House on April 7, 2007. The assembly had passed a bill granting financial powers to decide perks of judicial staff to the state judiciary. The bill was, however, referred back to the state assembly by the President of India for reconsideration. The Chief Minister Prem Kumar Dhumal while proposing the withdrawal took a hit at the previous Congress government of passing the bill without due consideration. He said that the financial powers regarding perks of state judicial staff should remain with the legislative. The Bill was passed unanimously by the House. After getting information the police along with a bomb disposal squad of Himachal Police reached the spot. The ‘bomb’ was in fact a container having some crackers but some wires were hanging outside the container. According to villagers the bomb disposal squad cut wires and then it was taken to a safe place for thorough checking. The squad found only some crackers inside the container.